Arthur I (Breton: Arzhur Iañ; French: Arthur Ier de Bretagne) (29 March 1187 – probably 1203) was 4th Earl of Richmond and Duke of Brittany between 1196 and 1203. He was the posthumous son of Geoffrey II, Duke of Brittany and Constance, Duchess of Brittany. His father, Geoffrey, was the son of Henry II, King of England. In 1190 Arthur was designated heir to the throne of England and its French territory by his uncle, Richard I, the intent being that Arthur would succeed Richard in preference to Richard's younger brother John. Nothing is recorded of Arthur after his incarceration in Rouen Castle in 1203, and while his precise fate is unknown, it is generally believed he was killed by John. Arthur was born in 1187, the son of Constance of Brittany and Geoffrey II of Brittany, who died before he was born. As an infant, Arthur was second in line to the succession of his grandfather King Henry II, after his uncle Richard. King Henry died when Arthur was 2 years old, and Richard I became the new king in his place. While Richard was away on the Third Crusade, Arthur's mother Constance sought to make the Duchy of Brittany more independent. On 11 November 1190, Arthur was named as Richard's heir and was betrothed to a daughter of Tancred of Sicily as part of their treaty. However, Emperor Henry VI conquered the Kingdom of Sicily in 1194, so the betrothal of Arthur came to nothing. A marriage plan, originally aiming to establish an alliance between King Richard and King Philip II of France to marry Arthur's elder sister Eleanor to Philip's son Louis also failed. In 1196, Constance had the young Arthur proclaimed Duke of Brittany and her co-ruler as a child of nine years. The same year, Richard summoned Arthur, as well as his mother Constance, to Normandy, but Ranulf de Blondeville, 6th Earl of Chester, stepfather of Arthur, abducted Constance. Richard marched to Brittany to rescue Arthur, who was then secretly carried to France to be brought up with Louis. Arthur paying homage to Philip II of France. Chroniques de St Denis, British Library. When Richard died on 6 April 1199, on his deathbed he proclaimed his brother John as his heir, fearing Arthur was too young to look after the throne. Arthur was only twelve years old at the time and under the influence of the French king. John immediately claimed the throne of England, but much of the French nobility were resentful at recognising him as their overlord. They preferred Arthur, who declared himself vassal of Philip. Philip recognised Arthur's right to Anjou, Maine, and Poitou. Upon Richard's death Arthur led a force to Anjou and Maine. From 18 April, he styled himself as Duke of Brittany, Count of Anjou and Earl of Richmond. In 18 September, John persuaded William des Roches seneschal of Anjou to defect, claiming Arthur would be a Capetian puppet. Four days later William took Arthur and Constance prisoners to Le Mans. Viscount Aimery, the seneschal appointed by John, took Arthur and Constance and fled the court to Angers, and later the court of Philip II. The Treaty of Le Goulet was signed by the kings John of England and Philip II of France in May 1200 and meant to settle once and for all the claims the Norman kings of England had as Norman dukes on French lands, including, at least for a time, Brittany. Under the terms of the treaty, Philip recognised John as King of England as heir of his brother Richard I and thus formally abandoned any support for Arthur. John, meanwhile, recognised Philip as the suzerain of continental possessions of the Angevin Empire. After the signing of the Treaty of Le Goulet, and feeling offended by Philip, Arthur fled to John, his uncle, and was treated kindly, at least initially. However, he later became suspicious of John and fled back to Angers. Some unidentified source said that in April 1202, Arthur was again betrothed, this time to Marie of France, a daughter of Philip II and Agnes of Andechs-Merania. After his return to France, and with the support of Philip II, Arthur embarked on a campaign in Normandy against John in 1202. Poitou revolted in support of Arthur. The Duke of Brittany besieged his grandmother, Eleanor of Aquitaine, John's mother, in the Château de Mirebeau. John marched on Mirebeau, taking Arthur by surprise on 31 July 1202. Arthur was captured by John's barons on 1 August, and imprisoned in the Château de Falaise in Falaise, Normandy. At the Chateau de Falaise, Arthur was guarded by Hubert de Burgh. According to contemporaneous chronicler Ralph of Coggeshall, John ordered two of his servants to blind and castrate the duke. Hubert de Burgh refused to let him be mutilated. [b][c] The following year Arthur was transferred to Rouen, under the charge of William de Braose. Arthur vanished in April 1203. Prince Arthur and Hubert de Burgh by William Frederick Yeames, 1882. Manchester Art Gallery. After King John had captured Arthur and kept him alive in prison for some time, at length, in the castle of Rouen, after dinner on the Thursday before Easter, when he was drunk and possessed by the devil ['ebrius et daemonio plenus'], he slew him with his own hand, and tying a heavy stone to the body cast it into the Seine. It was discovered by a fisherman in his net, and being dragged to the bank and recognized, was taken for secret burial, in fear of the tyrant, to the priory of Bec called Notre Dame de Pres. William de Braose was rumoured to have committed Arthur's alleged assassination. [d] Many years after Arthur's disappearance, and after a conflict with King John, William de Braose's wife Maud de Braose personally and directly accused the King of murdering Arthur. [e] Not only the Bretons, but even the king of France, Philip II, was ignorant of what actually happened, whether Arthur was alive or dead, if the former, where, and if the latter, how. Whatever his fate, Arthur left no known issue. The mystery surrounding Arthur's death complicated his succession. This succession was presumably influenced by both King John and King Philip II. [f] There were no male heirs to the ducal crown and so his succession as duke was constrained to several choices among his sisters. His sister Eleanor, the 'Fair Maid of Brittany', was also King John's prisoner. Eleanor also presented a complicating factor, if not a threat, to John's succession plans as King of England. She remained imprisoned for her entire life, through the reign of John's actual successor, his son Henry III of England. While imprisoned, she never married and had no issue. Her imprisonment and the fact that she was located in England made it impossible for her to reign as hereditary Duchess of Brittany. Murder of Prince Arthur by Thomas Welly, 1754. Engraving after The Death of Arthur painted by William Hamilton, National Galleries of Scotland. The death of Arthur is a vital ingredient in Shakespeare's history play The Life and Death of King John, in which Arthur is portrayed as a child whose innocence dissuades Hubert de Burgh from committing the murder demanded by King John. However, Arthur soon dies after jumping from his place of confinement in an escape attempt. In the 19th century, the Breton poet Auguste Brizeux wrote of Arthur in La chasse du Prince Arthur. In the novel Saving Grace by Julie Garwood, the heroine finds documents relating to Arthur's murder, committed under the orders of King John, by two of King John's barons. She is married to a Scottish Laird, Gabriel MacBain, to escape England, but is harassed by both King John's barons and the English faction hoping to take down King John, each party unsure of how much she knows. In Randall Garrett's alternative-history fantasy stories, the Lord Darcy series, Richard does not "succumb to his illness", but survives it. John Lackland never becomes king, and the Plantagenet line, descending from Arthur, continues down to the present day. In The Devil and King John by the Australian novelist Philip Lindsay, Arthur is killed by John in a fit of temper, but he is shown as a rebellious adolescent who did provoke John to some extent, rather than the innocent child in some versions. In his introduction, Lindsay acknowledged that he had no evidence that this is what happened to Arthur, but he considered it to be as good a guess as any. In 1912 the Breton composer Joseph-Guy Ropartz composed a symphonic poem, La Chasse du Prince Arthur (Prince Arthur's Hunt) after the poem by Brizeux. The Breton folk-rock band Tri Yann have made a song about Arthur's life. ^ The king of England bound himself in all ways as a vassal to his lord. He was required to obey summons, support his lord in war with troops or money, and to make payments of special feudal dues never before exacted from his lands. ^ To demoralise Arthur's supporters, Hubert de Burgh was to announce his death. ^ At this time his sister Eleanor had also been captured, then was imprisoned at Corfe Castle in Dorset. ^ William de Broase rose high in John's favour after Arthur's disappearance, receiving new lands and titles in the Welsh Marches. ^ It is alleged that King John reacted to this allegation by imprisoning Maud and her eldest son, William, in Corfe Castle in Dorset and starving them to death. William de Braose escaped to France, where he was supposed to have published a statement on what happened to Arthur, but no copy has been found. ^ While John remained suzerain over Brittany, he was also vassal to Philip II of France, and so the succession of Brittany relied as much on John's preferences, as on Philip's agreement. ^ This succession was agreed by Philip II of France. Philip replaced Guy as Alix's regent and then arranged her marriage to Pierre Mauclerc of the House of Dreux. 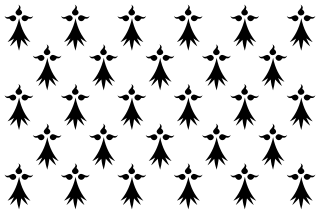 The House of Dreux was a junior branch within the Capetian dynasty. ^ Carley & Riddy 1998, p. 28. ^ McAuliffe 2012, p. 74. ^ Everard 2004, p. 146. ^ Everard 2004, p. 167. ^ Gillingham 1984, p. 88. ^ McDougall 2017, p. 226. ^ Seel 2012, p. 47. Carley, James P.; Riddy, Felicity, eds. (1998). Arthurian Literature XVI. D.S. Brewer. Everard, J. A. (2004). Brittany and the Angevins: Province and Empire 1158–1203. Cambridge University Press. Gillingham, John (1984). The Angevin Empire. Hodder Arnold. McAuliffe, Mary (2012). Clash of Crowns: William the Conqueror, Richard Lionheart, and Eleanor of Aquitaine. Rowman & Littlefield Publishers, Inc.
Seel, Graham E. (2012). King John: An Underrated King. Anthem Press. Wikimedia Commons has media related to Arthur I of Brittany. "Arthur (duke)" . Encyclopedia Americana. 1920. "Arthur (duke)" . New International Encyclopedia. 1905. William de Braose,, 4th Lord of Bramber, court favourite of King John of England, at the peak of his power, was also Lord of Gower, Abergavenny, Brecknock, Builth, Radnor, Kington, Limerick, Glamorgan, Skenfrith, Briouze in Normandy, Grosmont, and White Castle. Geoffrey II was Duke of Brittany and 3rd Earl of Richmond between 1181 and 1186, through his marriage with the heiress Constance. Geoffrey was the fourth of five sons of Henry II, King of England and Eleanor, Duchess of Aquitaine. 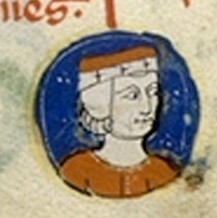 Peter I, also known as Peter Mauclerc, was Duke of Brittany jure uxoris from 1213 to 1221, and regent of the duchy for his minor son John I from 1221 to 1237. As duke he was also 1st Earl of Richmond from 1218 to 1235. Eleanor Fair Maid of Brittany, also known as Damsel of Brittany, Pearl of Brittany, or Beauty of Brittany, was the eldest daughter of Geoffrey II, Duke of Brittany, the fourth son of King Henry II of England, and Constance, Duchess of Brittany. After the presumed death in 1203 of her imprisoned younger brother, Arthur, she was heiress to vast lands including England, Anjou, and Aquitaine as well as Brittany, realms where the Salic Law barring the accession of females did not apply. Her uncle John, King of England was the fifth son of Henry II, and Eleanor inherited Arthur's claim to the throne as child of John's elder brother Geoffrey. Thus she posed a potential threat to John, and following his death in 1216, equally to her cousin, Henry III of England. She was imprisoned from 1202, and thus became the longest-imprisoned member of an English royal family. As a prisoner she was also unable to press her claim to the Duchy of Brittany as her mother's heiress. Conan IV, called the Young, was the Duke of Brittany from 1156 to 1166. He was the son of Bertha, Duchess of Brittany, and her first husband, Alan, Earl of Richmond. Conan IV was his father's heir as Earl of Richmond and his mother's heir as Duke of Brittany. Conan and his daughter Constance would be the only representatives of the House of Penthièvre to rule Brittany. Guy of Thouars was the third husband of Constance, Duchess of Brittany, whom he married in 1199 in Angers, County of Anjou between August and October 1199 after her son Arthur of Brittany entered Angers to be recognized as count of the three countships of Anjou, Maine and Touraine. He was an Occitan noble, a member of the House of Thouars. 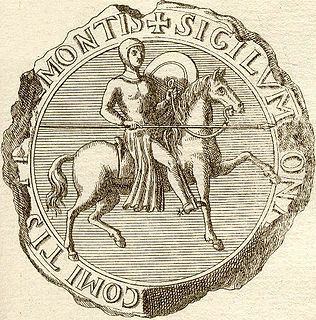 John of Montfort, sometimes known as John IV, Duke of Brittany, and 6th Earl of Richmond from 1341 to his death. He was the son of Arthur II, Duke of Brittany and his second wife, Yolande de Dreux. He contested the inheritance of the Duchy of Brittany by his niece, Joan of Penthièvre, which led to the War of the Breton Succession, which in turn evolved into being part of the Hundred Years' War between England and France. John's patron in his quest was King Edward III of England. He died in 1345, 19 years before the end of the war, and the victory of his son John IV over Joan of Penthièvre and her husband, Charles of Blois. The Angevin Empire describes the possessions of the Angevin kings of England who held lands in England and France during the 12th and 13th centuries. Its rulers were Henry II, Richard I, and John. The Angevin Empire is an early example for composite states. The Château de Falaise is a castle located in the south of the commune of Falaise in the département of Calvados, in the region of Normandy, France. William the Conqueror, the son of Duke Robert of Normandy, was born at an earlier castle on the same site in about 1028. William went on to conquer England and become king, and possession of the castle descended through his heirs until the 13th century when it was captured by King Philip II of France. 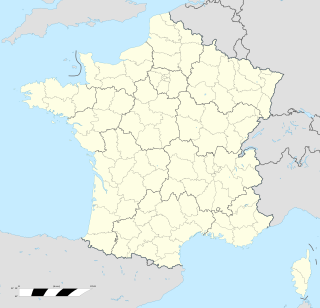 Mirebeau is a commune in the Vienne department in the Nouvelle-Aquitaine region in western France. The Normandy Campaigns were wars in Normandy from 1202 to 1204. 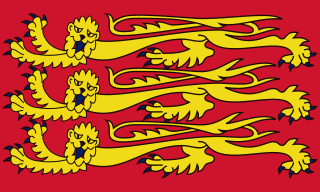 The Kingdom of England fought the Kingdom of France as well as fighting off rebellions from nobles. Philip II of France conquered the Anglo-Angevin territories in Normandy, resulting in the Siege of Château Gaillard. The Normandy Campaigns ended in a victory for France when the Anglo-Angevin territory was greatly diminished.